Readers may wish to recall how the Irish News named Frank Cushnhan and Ronnie Hanna as the two men arrested on June 2 while Fianna Fáil leader Micheal Martin called for a Commission of Investigation as recently as June 15. 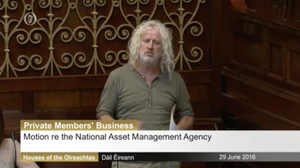 Independents 4 Change TD Mick Wallace speaking in the Dáil this afternoon. 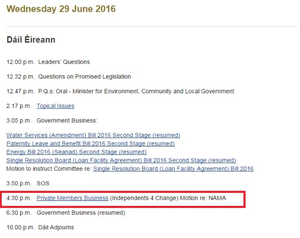 Posted in Misc and tagged Commission of Investigation, Fianna Fail, Nama at 5:28 pm on June 29, 2016 by Broadsheet. So initiate a criminal investigation in the republic then ? No? Ah for flip’s sake. Massive u-turn? This reeks to high heaven. Just to go back to Fine Fail, which I just cannot believe their change of position on this. 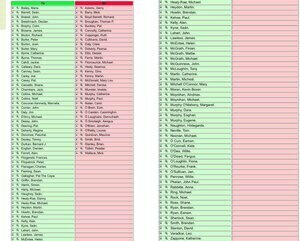 Anyone that reads their amendment and sees their excuse for not looking for a commission of investigation now. They’re saying now that it will need..they want all investigations completed before we have one. 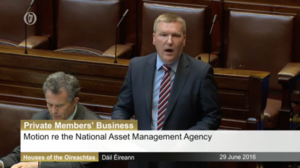 Well, first of all, NAMA are not being investigated by anybody at the moment. Secondly, what NCA are at in Northern Ireland or Security and Exchange in America, they’re in different jurisdictions. They would not interfere one iota if we had a commission of investigation.. it would not interfere one iota with theirs. Now I’ve checked on the legal advise side of it right.. I’m told, that all investigations will not be completed for at least 3 years. 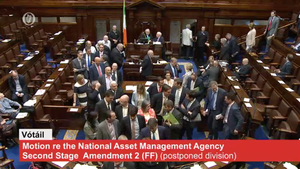 So are we going to postpone doing anything that’s gone on in Dublin for at least 3 years? 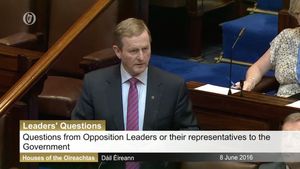 Is this serving the Irish public properly? Well, Baldy, is it? Are you with us Baldy? Someone poke him there lads to see if he’s still with us I just made that last bit up..Although he did look very bored in fairness. Someone poke him there lads to see if he’s still with us. Full stop. “We’ve got help from the people who fixed up Snowden”. Maybe he means Assange. I don’t imagine Mick would blend in easily with the locals in Russia.. I think he means the journalists. view of those in power over the loss of billions courtesy of Nama, it stinks.